Bluey came on just as our starters had arrived. He quietly arrived on the stage but he would soon command the attention of the crowd. He was supported only by a guitarist so it was clear that it would be an acoustic set but the quality of his voice proved that this was all he needed. He appealed to the crowd by singing party favourites such as Luther Vandross‘s Never Too Much & Montell Jordan‘s This Is How We Do It and he lightened the mood by doing his own version of the theme tune to The Fresh Prince of Bell Air. He also did a moving tribute to Whitney Houston by getting the crowd to sing Your Love is My Love with him. He then finished off the performance by singing his own song Showgirl which has a funky catchy feel to it. He left the crowd energized and ready for the main act. I was impressed enough to go on i-Tunes when I got home and buy Showgirl and his other available song Coming Back. He is definitely one to watch. I was slightly amused that prior to coming on stage Lloyd’s burly American security guards were leaning over the balcony trying to see the clearest path to the stage. But this amusement turned to a tiny bit of disappointment when they suddenly hustled him onto the stage. They surrounded him so that none of us that he had to walk past could get a decent picture or a handshake. It seemed that his security team had missed the point of the intimacy of the Jazz Cafe. The place was not full of hysterical teenagers, it was an adult crowd with a relaxed atmosphere. The overprotective security wasn’t necessary but I can forgive him as he put such great effort into his performance. He came on ready to make the crowd bounce along to my favourite tune of his Get It Shawty. The crowd were all hyped up an singing along and Lloyd seemed to be releasing pent up energy by bouncing around the stage. He never let the high energy drop once and he clearly loved being up there which in turn made him a pleasure to watch. The hits kept on coming and included fan favourites such as Bedrock, You and Girls Around the World which I felt was particularly well performed. Lloyd slowed it down a little for two tracks from the recent album King of Hearts. Lay it Down and Cupid were beautifully sung and the crowd all happily sang along too. He also threw in a wonderful tribute to Michael Jackson by covering Human Nature. Towards the end the tempo picked up again as he belted out more tracks from the new album such as Be The One and UK number 3 hit Dedication To My Ex. I was amused that only half the crowd singing along to Dedication to My Ex knew the uncut version. But for those with more sensitive dispositions that’s probably just as well! 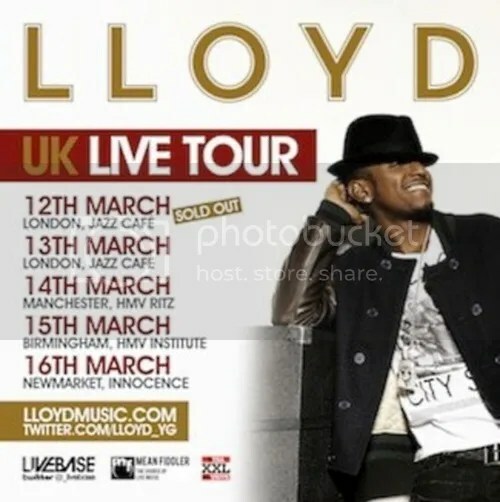 Lloyd was a joy to watch on stage and he loved getting the crowd invovled. It was an utter pleasure to be present for such a close up performance. Bluey Robinson and Lloyd managed to make a Monday feel like a Friday night. Thanks to their talent and energy I was on a high for the rest of the week and it’s been fun reliving it by writing this review. So thank you to both of them and the Jazz Cafe for hosting such a good night. 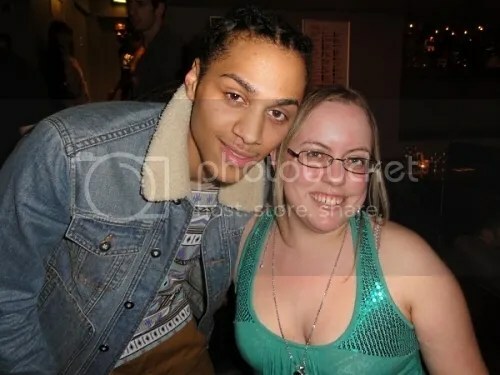 This entry was posted in Concert Review, Hip-Hop, R&B and tagged Bluey Robinson, Concert, Jazz Café, Lloyd, London, New Orleans, R&B, YouTube by krazyangelkat81. Bookmark the permalink. I’m glad you felt like that – that was what I was hoping for. Oh Liz you are such a sweetie – HUGS.